Practice for your next job interview with questions recruiters actually ask. Some of these questions are what you’d expect. Some of these questions frankly don’t make much sense. And some of these questions are shocking and possibly offensive. But as the questions most likely to be asked, you need to be ready. This article was the inspiration for the book Winning Answers to 500 Interview Questions by Lavie Margolin, where you can get all the popular interview questions and recommended answers in a handy reference format. Check it out. Questions 1-80 are about personal background. Questions 81-178 relate to work experience. Questions 179-235 cover your education or academic background. The rest are about your personality, motivations and thoughts on work. Where else have you applied? OR Who else have you applied to/got interviews with? OR Are you interviewing anywhere else? How do deal with a colleague who is less punctual? What in your view makes a person likeable? 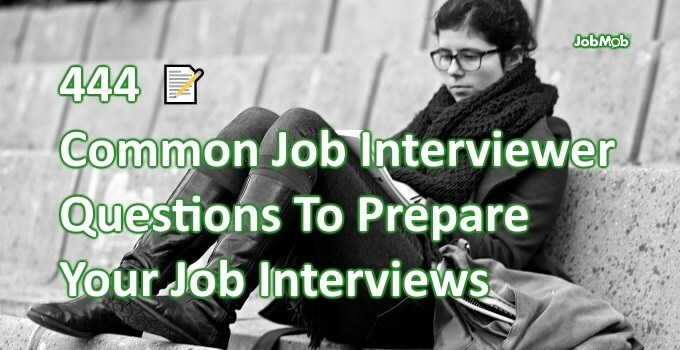 Subscribe to JobMob via email and follow me on Twitter for more top job interview questions you need to know. This is great material for people who set up mock interviews for job searchers. Lavie’s book is a great place to start for guidance on specific answers. Crafting for a specific interviewer comes with a) research/listening for what will/not impress a given interviewer, and b) practice to be able to adapt on the fly. Job fairs are great for this because in a short amount of time, you can talk to many recruiters and get immediate feedback whether in the form of a comment or even just body language. Many micro-interviews, basically, so you can experiment more easily and build confidence for the few full-length interviews where the stakes are higher. If an HR asks template questions he/she will receive pattern answers. A candidate can think over all 400 of them but the best way to check a future employee is to organize some testing days.